I lived in Burkina Faso for most of my working life, and travelled in Mali and Niger, too. These countries provided the inspiration for all of my books. I met this lad in Ouagadougou (capital of Burkina Faso) a few weeks ago. We found ourselves sitting next to each other at a street-corner Nescafe kiosk and talked about this and that. He told me about his life as an aspiring reggae musician and about his encounter the previous day with rioting militia. He gave me a CD and I took his photo. There was so much about the meeting which was typical of West Africa – the sickliness of the cafe au lait (made with half a bowl of sweetened condensed milk), the noise and bustle of street vendors and passing taxis, and the friendliness of strangers. Burkina Faso is an extraordinarily easy place to make new friends. I am going to be posting a snapshot of my life in Burkina Faso every Monday and Thursday. Do check in from time to time and feel free to comment. Hopefully as I get used to doing this, my photography will get better. In the meantime, please bear with me. So it seems I have chosen a bad time to visit Ouagadougou. On Thursday there were huge demonstrations against rising food prices – “la vie chère”. On Friday the military ran amok, shooting in the air, looting and carjacking. On Saturday, shopkeepers were on the streets, demonstrating against the pillaging and the collapse of their businesses. Hotels were ransacked and shot to pieces, including two of the biggies: Hotel Independence and Hotel Excellence. There have been injuries and deaths, including deaths from stray bullets (bullets fired into the air but coming down through people’s roofs). Many people have been kept awake by overnight firing. Lots of people are afraid and hiding in their houses. A city-wide curfew has been imposed – 7 at night to 6 in the morning. Give us some news, we are not sleeping. Give us some information. Recruited to protect the people, [the military] is instead terrorizing them. Who trained these soldiers? If it’s because of money that they are sowing fear among the people and preventing them from sleeping, it means that getting rich is more important to them than the safety of those they are sworn to protect. If it’s another goal they are after, they should say so clearly, but they should pursue [this goal] without putting the people in danger. If you no longer want the President, why didn’t you say so when you met with him [referring to recent talks between the president and the military]? What is behind all that? Those who wave their sabres end up doing themselves an injury. Please give peace to the people and not fear and insecurity. Burkina no longer has a President. When a president is there to serve himself and not his people, you have to say that he is completely useless. Ever since the first alteration to Article 37 [allowing the President to stay on for more than two terms] I knew we could not count on him. You [the military] have another problem to solve. Your wish is to replace those currently in power, but you don’t care about normal citizens. It would be better to conduct your fight in other ways than in this shooting and looting which disturbs the peace and security of honest citizens. May God save the Faso! Tell us, have our soldiers become little delinquents? Every time there are problems, they attack the shops of our poor citizens. Today I hear people saying that we should fight without taking up arms. That’s all very well but we first need everybody to commit to fighting truly and solidly. Each of us must ask the question: what have I myself done to install true democracy in my country? Once everyone has been able to answer this question honestly and conscientiously we will be able to move onto our struggle without recourse to arms – even though those in power have taught us that everything is solved by arms, for example in Ivory Coast. It’s not too late to avoid this recourse to arms which is not at all good for us Africans. What I don’t understand is people’s unwillingness to see reality. How many of us can afford to pay for medicines, food, rent, education without it costing us the eyes in our heads? There is a widening abyss between the extreme poverty of many and the insulting riches of others…everyone at his or her own level should take the responsibility to try and change the things that make us stagnate in misery and darkness. Having an army is like having a dog. You can set it on your enemies if you feed it well. However, the day you don’t feed it, it will turn on you. In place of empty words, is there a specialist here who can tell us how we can protect ourselves from stray bullets? [there has been so much shooting in the air that bullets have been raining down on peoples houses and through the roof, causing injury or occasionally death] Is there a part of the house where the risks are lower? Thank you in advance. It’s interesting to see all these people commenting on the peace that is so precious to us. Yes, we want peace; yes, peace is priceless and we understand that so much better when we look at the Ivory Coast drama. All that is true. But various people are forgetting that no lasting peace can be built on foundations of injustice, impunity and social, political and economic exclusion. All those who are so concerned about the peace in our fine country should fight for human rights and for justice. And today, when elements of the RSP (the perpetrators of the evils of this regime,) are using arms for their vengeance, it’s an unmistakeable sign that Mr Comparé [sic] has lost control of his herd. Logic dictates that he who trains a crocodile to eat others will end up getting eaten himself. Take the high ground and let us fight for the genesis of true democracy, the only guarantee of peace and stability. We recruit, we recruit, as if there weren’t already enough soldiers in Faso! We don’t need all these people in uniform. Most of them are wasters, it would be better to have an army of quality than an army of quantity. They let their kalashnikovs do the talking and behave like thugs. Think of the majority of civilians here who have been reduced to powerless silence [by the events of recent days]. There is too much inequality and injustice…it’s the same small minority who gobble everything up, and it’s been going on for a very long time. Enough is enough. But where is the Burkina of Upright Men? I don’t think the problem is purely a financial one. Another complaint is to be found elsewhere: Some eat, whilst others do the work. I really think people are tired of the current regime. Why did the mutineers attack the house of their Chief of Staff? There is too much injustice in this country and it’s time to be done with it, but not by means of arms. It’s truly frightening what is happening in Burkina. If we have to wake up in the middle of the night because of the sound of bullets in our yards and in front of our gates, we have cause to be annoyed at the behaviour of those in uniform. We are the victims of this situation. May God protect us! I picked up many [spent bullets] this morning in my yard. I don’t want to encourage the military but it’s obvious that they’re not firing for the fun of it. This is the same phenomenon as the civil demonstrations of 8 April, with the only difference being that [these protestors] are armed and can easily lose control. Who can prove that if civilians were armed they wouldn’t be using their arms in the same way right now? We saw the vandalism that was perpetrated during the protests by schoolchildren and students. Why can’t people understand that? It’s very frustrating and discouraging when you don’t get your pay at the end of the month and have to sleep on an empty stomach. There is a nice line in the film ‘Mobutu, King of Zaire’ which always challenges me in my choices, both big and small: ‘You can fool all the people some of the time; you can fool some of the people all of the time; but you can’t fool all the people all of the time.’ This is true in the system of governance and also in interpersonal relations. It makes you despair, the implications of these expressions of anger in our country, every time we come to this. If we are believers we should not stop praying. But I firmly believe that the most important thing is for each of us to try to cultivate truth and good faith in all that we undertake…it is excellent when we defend Truth and it is sad when we play at deaf-dumb-blind. Dear brothers and sisters, I respect the opinions and standpoints of everyone and I am a partisan and an artisan [lit: craftsman] of peace. I wish for Peace in Faso. I am sorry to disillusion some of you, but this peace we are used to in Burkina is what I call ‘THE PEACE OF THE GRAVEYARD’. We should not content ourselves with everything seeming calm. We might have calm, but JUSTICE AND PEACE should go together. We know that our country’s resources will not assure everyone’s wellbeing but we could still be doing more towards achieving social justice. Lets go beyond the shooting and the aggressive demonstrations in order to understand the roots of the country’s malaise. Revolution is necessary and sometimes painful, and if we have to experience it, we will experience it, not to be copycats but in order to survive. AFTER 20 YEARS IN POWER: BALANCE SHEET. The message is clear, we need a change (of regime and not just of one person). I deplore what is happening right now in our fine country. I had a bullet come through the roof of my house and land next to me in my living room. May there be an end to it. Some eat, others watch them! That’s how revolutions are born. I don’t understand those who seem to be rejoicing in this situation. 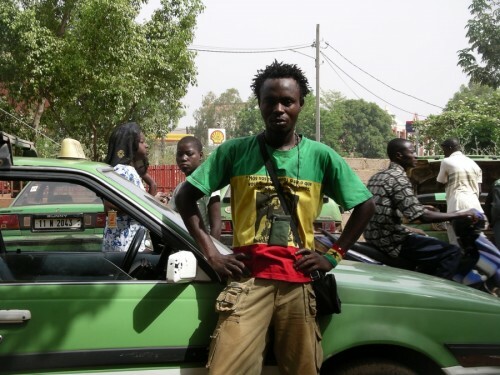 Is wanting peace in Burkina Faso the same as being pro-Blaise [the president]? When a women loses her child, do you believe here pain would be different depending on whether she was a supporter of the government or the opposition? We want peace, full-stop, that’s all. These soldiers who are behaving like juvenile delinquents should be treated as such. And to those who live outside this country and advocate their pseudo-rebellion: Come back here and stage your revolution yourselves! 15 April 13:38 by Ham.bou. You are right! These revolution should not be happening. As has already been said, revolution is not a ‘fashion’. Merde! Stop believing that a revolt would be good for our people. If we topple Blaiso, who will we get in his place? A soldier? Some faithless lawless opposition bloke? Whatever we get, it will be worse!!!! Let’s leave Blaise in power until 2015! This country is not a perfect democracy, okay! But we are making progress each year on every level! And this comment is the proof that freedom of expression does have a place in this country (thanks to Lefaso.net, by the way) Long live Faso! We see this present disorder in Burkina, but who is to blame? There are lots of people who are discontent in Burkina? Who is to blame? Personally, I am not interested in tomorrow, what interests me is my debts, my salary and the rising prices of fuel and food. Any change which sorts these things out will be very welcome. We understand and support the demonstrations of civilians (non-violent, so far as is possible) and above all we follow the development of the situation with interest. We call for peace in Burkina and true democratic governance. They [the military] must all be punished, such behaviour is deplorable, but what is behind it? Those who support or even try to justify this shameful behaviour [on the part of the military] have surely not lost a loved one during these protests. We still remember young Madina, killed in the flush of youth! [Madina is a girl who was killed by a stray bullet] Excuse the term, but her death was ‘cadeau’ [a gift]. She didn’t die defending a cause, she was not assassinated by anyone who will be pursued and brought to justice; no one will pay for this crime. Do you think this is what we would wish for our country? Someone will surely call this ‘collateral damage’ – but isn’t that a phrase invented by Westerners for crimes that should never have happened? It is shameful that these soulless faceless soldiers, words desert me, are putting their pockets before their patriotism. If they are strong and they really need the money, I want to let them know that Kadhafi needs good soldiers are he pays cashhhhhhhh. I agree with you. We’re fed up of these soldiers without conscience or scruples. Their actions are unspeakable. Vous nous cassez sérieusement les bonbons. [You are seriously breaking our nuts].